I take most of my inspiration from nature, and I've always been happiest surrounded by wildlife and countryside - even just watching the leopard slugs that sneak into the kitchen pleases me immensely. When I was little I loved to collect all the intriguing little things that nature seemed to have discarded - snail and sea shells, delicate leaf skeletons, patterned feathers and iridescent butterfly wings, the fuzzy bodies of dead bumble bees... I kept it all in a shoe box, which became known to my family as the Dead Box. I can't remember who christened it, but at one point it even contained a fox's skull, stripped entirely of flesh except for the perfect black nose. I wish I still had it; I think my mum might have seized her opportunity when I left for college and 'lost' it. My mum told her friends all about my Dead Box over tea and cake while I sat in the garden and recited The Tale of Peter Rabbit to snails. This led to a sort of Dead Box Chinese whispers - a few years ago I saw a guy who had lived down the road from me growing up, and he asked if I'd still got "that box with the dead pigeon in it..."
But why am I sharing all this? Because I've decided to start a new Dead Box. I doubt I'll ever get anything as good as the fox's skull again, but I love to be able to hold something, to turn it round and round to draw from all perspectives, and get up close with a magnifying glass. You can't be so intrusive with a live animal, and I find all these wonderful creatures hugely inspirational. For ages I've had the body of a gorgeous banded demoiselle damselfly, who died before it's wings could fully unfold, sitting on my shelf, as well as a large yellow underwing moth that fell out of a bag full of old camping stuff from the shed. The other day I added a jet black ichneumon wasp, with perfectly curled antenna, that I found in the kitchen (I think he came in with the Seville oranges). 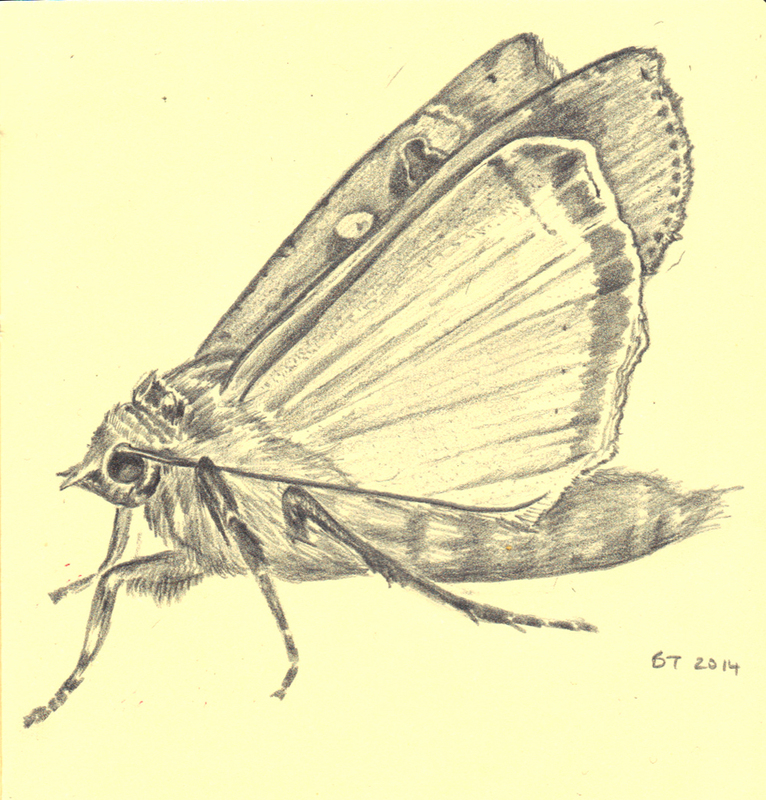 I drew the moth yesterday for a birthday card. Just look at that fuzzy little body!